Thar an Trasnán: Big Names, Big Games in Store for the Weekend. Tom's and Galway do it over again on Sunday. The senior hurlers of Galway and Fr. Tom’s meet again on Sunday afternoon at the ICC in a game that Galway will be hoping to win to even the series in the this best of 5. Last time around the win was snatched out of the grasp of the Westerners thanks to an injury time goal. The game was as close as they come, and if proves to be a marker of what is in store on Sunday, prepare for another nailbiter. Having had one meeting under their belts, and established a degree of familiarity, the game might open up earlier. Last time out the early exchanges were cagy. Tom’s will be looking to the Waterford man, MJ Sutton, to lead the half back line and the scoring ability of Stiofan McMahon. The man from Broadford, Co. Clare was on the mark from the free all day last time out. For Galway the An Rinn, Co. Waterford native, Jamie Barron did well in the middle of the field, and the main scoring threat came from John Coleman. A win for Tom’s puts them one game from winning the 2017 senior hurling title, Galway will want this one badly. joined by fellow Strabane native, Danny McBride for Sunday. In senior football Aidan McAnespies will be pushing for the win against an unbeaten Donegal team. It will not come easy. Donegal have yet to lose a game and have brought Mayo’s Enda Varley into the mix, as well as another seasoned performer at the highest level in Ballymun Kickhams Ted Furman. The Macs might be pulling straws to see who gets the Furman marking job. Last time out Stephen McBrearty had to leave the field, and if he is back in action Sunday that will make Donegal all the stronger. McAnespies will have to play their cards to perfection to get a result, and will need stellar performances from their key men. There have been a couple of late additions to the McAnespies panel, Clonoe man Rhys Quinn and Strabane’s Danny McBride who has seen action with Tyrone. There will be no shortage of commitment next Sunday for this one, could be worth the price of admission. to a win over Galway. Galway and Shannon Blues meet in the final game of the day. Galway have put together team that plays good football and is solid at the back. Every man does his job and nobody tries to carry the team single handedly. With a week’s rest and couple of players well able of taking their scores up front, as well as home based stalwart Kevin Cummins yet to break out of his shell this year, Galway might spring out of the blocks and start well. The Blues ground out a result last week versus the Connemara Gaels, and the lineup looks formidable, yet they still have their best performance ahead of them you feel. It was a newcomer, Josh Ryan, who made the impact both at the beginning of the game with an early goal and at the end with the match winning point in injury time. It will be an interesting game, and looks to prove to be an entertaining one. I’d expect to see very little between the teams when the final whistle blows. The Ladies footballers are also back in action on Sunday. 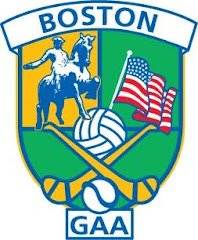 Connacht Ladies took a shelling at the hands of the Boston Shamrocks the last time the teams met, no doubt they will be looking for a better performance on Sunday. The Shamrocks have plenty of firepower, especially with the likes of Sarah Jane McDonald and Tessa Crowley in their front six. Connacht Ladies will need to tighten up their rearguard to try and keep in the game. The westerners have plenty of talent in their lineup and a win might prove to be an unexpected outcome, but if it remains close coming into the last 15 minutes, anything can happen. Saturday sees 2 junior A hurling games. Tipperary and Offaly meet, Tipperary having walloped both Galway and Wexford in their first 2 games. Offaly should prove to be a tougher test. The earlier game sees Fr. Tom’s meet a struggling Wexford. Wexford will hope to keep up an hour of good hurling, but will have their hands full against a good Tom’s side. We also have the visit of Portland and Hartford to the ICC for a junior C championship encounter on Sunday with each team looking for their first win of the season.